Laparoscopic view of a horse's spleen. (The purple and gray mottled organ). The spleen is a vascular lymphoid organ found in most vertebrates, normally close to the stomach in the abdominal cavity, and that functions in various activities related to the circulatory system and the immune system. The spleen is involved in filtering blood of foreign invaders and old red blood cells (erythrocytes), destruction of old red blood cells and recycling hemoglobin, storing blood and holding a reservoir of red blood cells, producing lymphocytes, sometimes serving as a center for forming red blood cells, and possibly forming antibodies. It is regarded as one of the centers of activity of the reticuloendothelial system (part of the immune system). As with other parts of the body (cells, tissues, other organs, and organ systems), the spleen provides larger benefit to the body and likewise is dependent on other organs, as well as cells, tissues, and organ systems, for its own proper functioning. This principle whereby each body part provides some benefit to the whole and to other body parts, while also receiving benefit, underlies the complex coordination and harmony seen in organisms. Until recently, the purpose of the spleen was not known. Historically, it was considered the seat of passion or emotion, and thus its expression in the modern English phrase "vent one's spleen." It is increasingly recognized that its absence leads to a predisposition to certain infections. The human spleen is located in the upper left part of the abdomen, behind the stomach and just below the diaphragm. In normal individuals, this organ measures about 125 by 75 by 50 millimeters (5 by 3 by 2 inches) in size, with an average weight of 150 grams. The spleen is the largest organ derived from mesenchyme and lying in the mesentery. It consists of masses of lymphoid tissue of granular appearance located around fine terminal branches of veins and arteries. These vessels are connected by modified capillaries called splenic sinuses. Approximately ten persent of people have one or more accessory spleens. 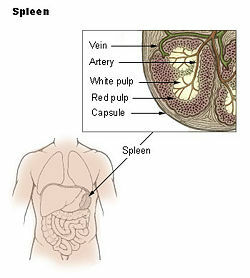 They may form near the hilum of the main spleen, the junction at which the splenic vessels enter and leave the organ. 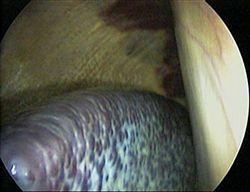 phrenicocolic ligament - connects left colic flexure to the thoracic diaphragm. To understand this terminology, it helps to know that "lien" is an alternate root for "spleen." Creation of red blood cells. While the bone marrow is the primary site of hematopoeisis (formation of blood cells) in the adult, up until the fifth month of gestation, the spleen has important hematopoietic functions. After birth, no significant hematopoietic function is left in the spleen except in some hematologic disorders: e.g., myelodysplastic syndrome, hemoglobinopathies. Storage of red blood cells and other formed elements. This is only valid for some mammals, such as dogs and horses. In horses, roughly 50 percent of the red blood cells are stored there. The red blood cells can be released when needed. In humans, however, the spleen does not function as a deposit of red blood cells, but instead it stores platelets in case of an emergency (Carey 2006). These animals also have large hearts in relation to their body size to accommodate the higher-viscosity blood that results. Some athletes have tried doping themselves with their own stored red blood cells to try to achieve the same effect, but the human heart is not equipped to handle the higher-viscosity blood. Enlargement of the spleen is known as splenomegaly. It may be caused by malaria, sarcoidosis, infectious mononucleosis, bacterial endocarditis, leukemia, pernicious anemia, Gaucher's disease, leishmaniasis, or Hodgkin's disease]]. Splenomegaly diagnosis involves a complete blood count with differential, platelet count, and reticulocyte and atypical lymphocyte counts to exclude hemolytic anemia and leukemia. Assessment of IgM antibodies to viral capsid antigen (a rising titer) is indicated to confirm Epstein-Barr virus or cytomegalovirus. Other infections should be excluded if these tests are negative. The absence of a spleen predisposes to some septicemia infections. Sickle-cell disease can cause a functional asplenia (lack of normal spleen function) or autosplenectomy (when a disease causes lack of normal spleen function, as if removed surgically) by causing infarctions of the spleen during repeated sickle-cell crises. The spleen may be removed surgically (known as a splenectomy), and indeed often is. For example, it may be removed following abdominal injuries with rupture and hemorrhage of the spleen, or in the treatment of certain blood diseases (Idiopathic thrombocytopenic purpura, hereditary spherocytosis, etc. ), certain forms of lymphoma or for the removal of splenic tumors or cysts. The word spleen comes from the Greek splēn. In French, spleen refers to a state of pensive sadness or melancholy. It has been popularized by the poet Charles-Pierre Baudelaire (1821-1867) but was already used before, in particular in the Romantic literature (eighteenth century). The connection between spleen (the organ) and melancholy (the temperament) comes from the humoral medicine of the ancient Greeks. One of the humors (body fluid) was the black bile, secreted by the spleen organ and associated with melancholy. In contrast, the Talmud (tractate Berachoth 61b) refers to the spleen as the organ of laughter, possibly suggesting a link with the humoral view of the organ. In German, the word "spleen," pronounced as in English, refers to a persisting, somewhat cranky (but not quite lunatic), idea or habit of a person; however the organ is called "Milz," (cognate with Old English milte). In nineteenth-century England, women in bad humor were said to be afflicted by spleen, or the vapors of spleen. In modern English "to vent one's spleen" means to vent one's anger, such as by shouting, and can be applied to both males and females. In China, the spleen 脾 (pí) counts as the seat of one's temperament and is thought to influence the individual's willpower. Analogous to "venting one's spleen," 发脾气 is used as an expression for getting angry, although in the view of traditional Chinese medicine, the view of "脾" does not correspond to the anatomical "spleen." Barcroft, J., H. A. Harris, D. Orahovats, and R. Weiss. 1925. “A Contribution to the Physiology of the Dpleen. J Physiol. 60(5-6): 443–456. Barcroft, J., and J. G. Stephens. 1927. “Observations Upon the Size of the Spleen.” J Physiol. 64(1): 1–22. Carey, B. 2006. “Horse Science: What Makes a Derby Winner.” MSNBC.com (May 5, 2006). Retrieved September 11, 2007. McCance, R. A., and E. M. Widdowson. 1955. “The Size and Function of the Spleen in Young Puppies. J Physiol. 129(3): 636–638. This page was last modified on 24 June 2009, at 12:06.